At 4 years old, children are preparing for school. We get them ready to go. 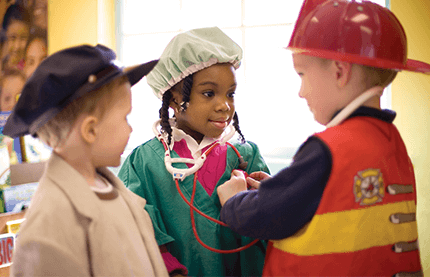 Kiddie Academy® is a tight-knit community where we prepare your growing 4 year old for kindergarten. Our Ready, Set, Go curriculum is designed around monthly themes with hands-on activities. Children learn math, science, vocabulary and social skills. Everything your child learns each day is reinforced and extended throughout the year to prepare him for school. 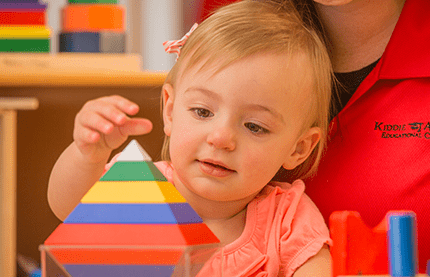 At Kiddie Academy, we continue the learning process throughout the entire day. Your child will interact with peers and teachers in small and large groups. 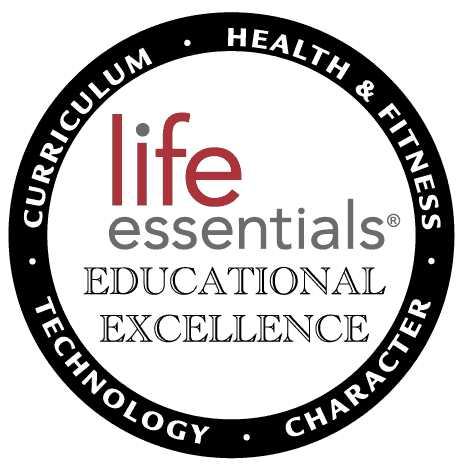 Through our Life Essentials curriculum, children will work at their own pace. They will have the opportunity to discover in our learning centers, as well as outside on our age-appropriate playground. 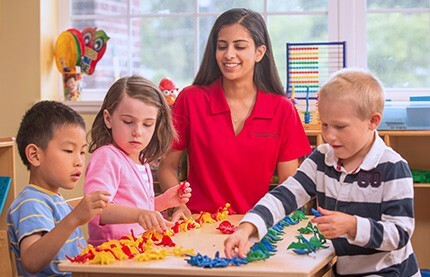 Kiddie Academy understands that 4 year olds are eager to learn new things. They are enthusiastic to make new friends and are able to do many more tasks independently. We take all of this into consideration when developing the Ready, Set, Go curriculum. 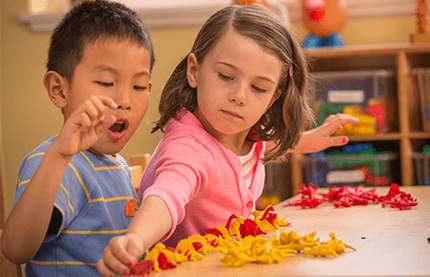 The Ready, Set, Go preschool day care curriculum focuses on your 4-year-old child's primary areas of development. Language Arts and Literacy: At 4 years old, children begin to realize that they can put letters together to make words, and words together to make sentences. Your child will practice writing skills while writing his name and simple words. All 4 year olds love to sing, recite poems and share stories about their lives. We let your child lead the way as our expert teachers give encouragement to help your child along. Mathematics: In the Ready, Set, Go curriculum, your child will count and compare objects and groups of objects. Your 4 year old will participate in making graphs, completing patterns and measuring things with conventional and nonconventional measuring tools. Science: At 4 years old, children are naturally inquisitive, so we created the science portion of the Ready, Set, Go curriculum to meet their needs. Children make observations, chart weather daily and identify differences in the seasons. They plant seeds and record the growth, learn the importance of keeping the earth clean and how to recycle at school and home. Social and Emotional Development: Children begin to understand the meaning of friendship by the time they’re 4 years old. They hug each other or sit with their arms around one another as they read a book. They begin identifying their feelings. At Kiddie Academy we encourage children to discuss their emotions, to tell friends why they are special and to share enthusiasm for new people and new things. Gross and Fine Motor Development: At 4 years old, children have good control of their fine motor skills. They use crayons to turn scribbles into letters and words. They can zip, button and snap their own clothes. During Family Style Dining, 4 year olds will serve themselves, passing food to others and use forks and spoons to eat. 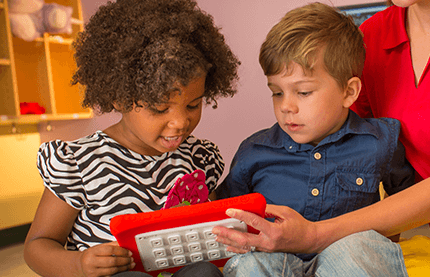 At Kiddie Academy we know that learning happens all the time, not just in the classroom. When your child is outside on our age-appropriate playground, the learning continues. Your child will chase friends, climb up the ladder and slide down the slide, walk like a gorilla and jump like a kangaroo. Character Education: At Kiddie Academy we believe it is important to introduce children to a wide variety of character traits. In order to further your child’s character development, we focus on a positive value each month; such as, honesty, generosity and patience. This helps children better understand our society and helps them develop into caring young adults. 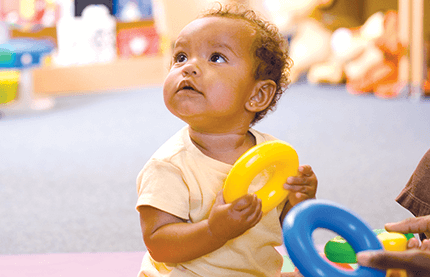 Our Ready-Set-Go curriculum focuses on the natural curiosity of young children. STEM experiences encourage our children to explore, observe and inquire, to increase their foundation in scientific learning. 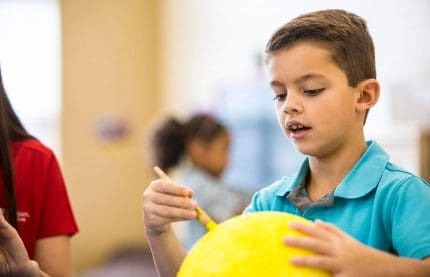 The children will be invited to participate in activities focusing on Earth and Space, Physical, and Life Sciences, promoting an increase in their investigation, discovery, and inquiry skills. Technology and Engineering skills are taught through activities and experiences that encourage the children to find out how things are constructed and work. Technology in also incorporated in our Four-Year-Old classrooms through the use of computers, tablets, and Smart Boards. 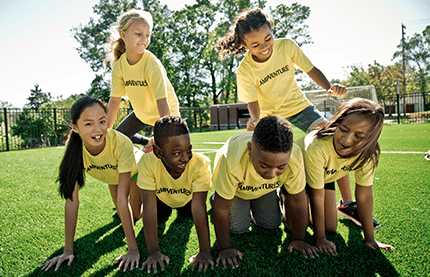 Engineering experiences focus on solving practical problems through the development of technology, and children will be encouraged to engage in activities that focus on designing, building and testing solutions through play. 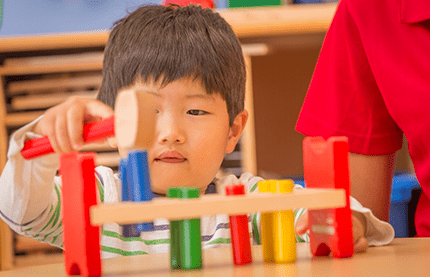 Mathematics experiences promote increasing logic and basic math skills through play with blocks, hands-on materials, and activities designed to help children learn one-to-one correspondence, ordering and classification skills.